The perfect base for your recreational adventures! Enjoy WiFi, cable TV and more...check for availability! 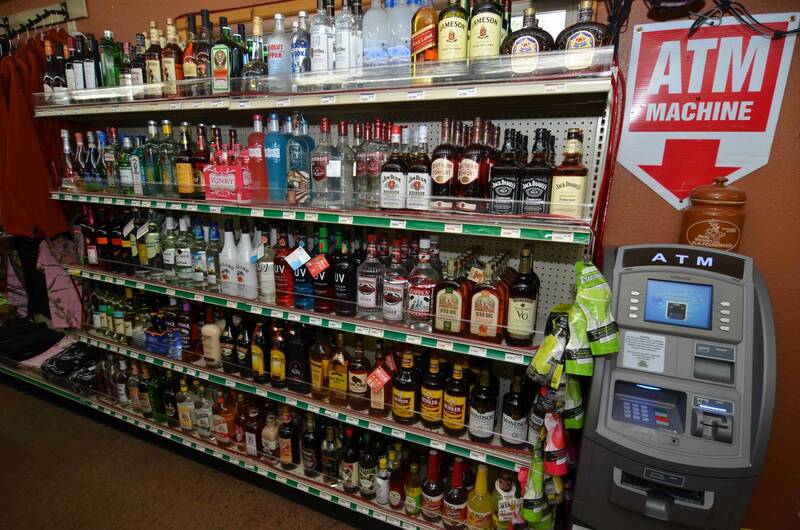 Our FULL GROCERY STORE saves you gas and time! Wine, beer, and liquor? We've got it! Make tracks to Clam Lake Junction! Welcome to the Clam Lake Junction in Clam Lake, Wisconsin! Our Clam Lake motel, grocery store – with weekly deliveries of fresh produce, meats and bakery items – and gas station with 24/7 pay-at-the-pump service is located in Wisconsin’s elk country in the heart of the Chequamegon National Forest on scenic Northern Wisconsin roadways and fantastic snowmobile and ATV trail systems. We have 6 comfortable, clean motel rooms with air conditioning, wireless internet, clock radio, microwave, refrigerator, Cable TV, 32″ flat screen TV, and hair dryer. There are two fire pits with benches and chairs and a picnic area for our guests. 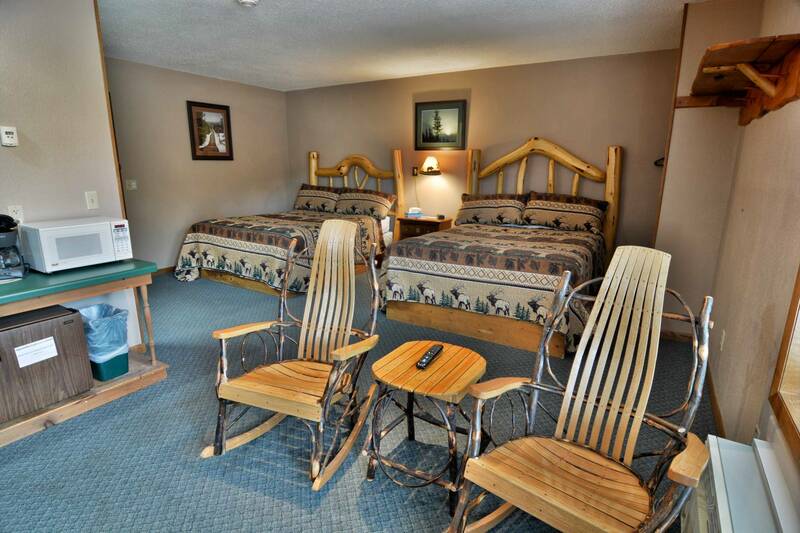 Convenient and affordable lodging in Clam Lake, Wisconsin! Great spot for fall color tours, snowmobile trips, hunting the national forest, and ATV rides. 72 hour cancellation policy. The Clam Lake Junction is your local grocery store! We have weekly deliveries of fresh bakery items like cookies, bread and donuts. We can also do custom order cakes! We have fresh meats including steaks, chicken, pork and ground beef as well as fresh fruit and vegetables! 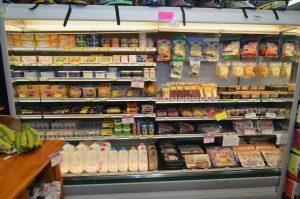 We can do custom orders so stop in and check out the new grocery selections available at your local grocery store in Clam Lake, Wisconsin. Stop in for fresh, hot coffee and donuts, too! Relax in our lounge area with WiFi. 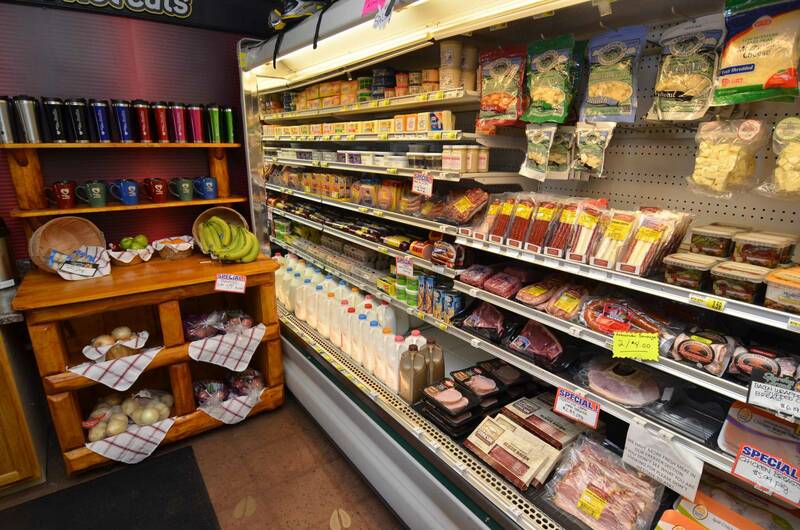 Our well stocked store has groceries including bread, snacks, milk, juices, soda, beer, wine, liquor, Wisconsin certified cheeses, fresh meats and produce, salsa, jellies, pickled garnishes and Wisconsin maple syrup. So if you’re camping at the Chequamegon National Forest Campgrounds at Day Lake, East Twin Lake, Lake Namekagon, Black Lake, Mineral Lake or just passing through town on your way to your favorite campground be sure to stop at the Clam Lake Junction and stock up on camping and fishing supplies! We also have fishing, hunting and camping supplies! 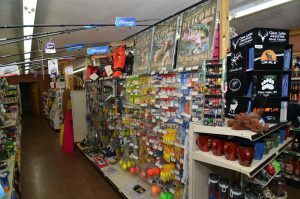 Live bait, fishing tackle, toiletries, charcoal, LP gas and more hunting and camping supplies are available, too. The Clam Lake Junction is located in downtown Clam Lake, Wisconsin right on the trails in Northern Wisconsin’s Chequamegon National Forest. The 6 room motel & convenenience store with fresh groceries, trail passes, hunting and fishing licenses are conveniently situated at the intersections of Hwy 77 (part of the Great Divide National Scenic Highway), Cty M & Cty GG only a short drive from Hayward, Cable, Glidden and Mellen, Wisconsin. 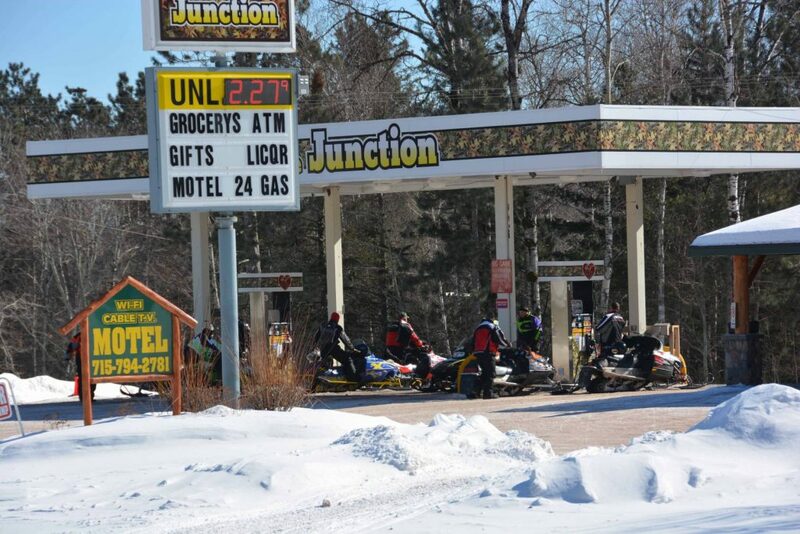 The Clam Lake Junction is located on some of the best ATV and snowmobile trails in Northern Wisconsin. The Dead Horse Slough ATV trailhead is only 2 miles east of Clam Lake on Hwy 77. Snowmobile trails #8 and #9A intersect Clam Lake and connect to hundreds of miles of well groomed, scenic snowmobile trails. With premium gas, oil, supplies and hot coffee, be sure to fill up at the Clam Lake Junction! With 6 comfortable motel rooms, The Clam Lake Junction makes a convenient lodging option for exploring the great trail systems running through Ashland County, Sawyer County, Price County & Bayfield County Area of Northern Wisconsin. 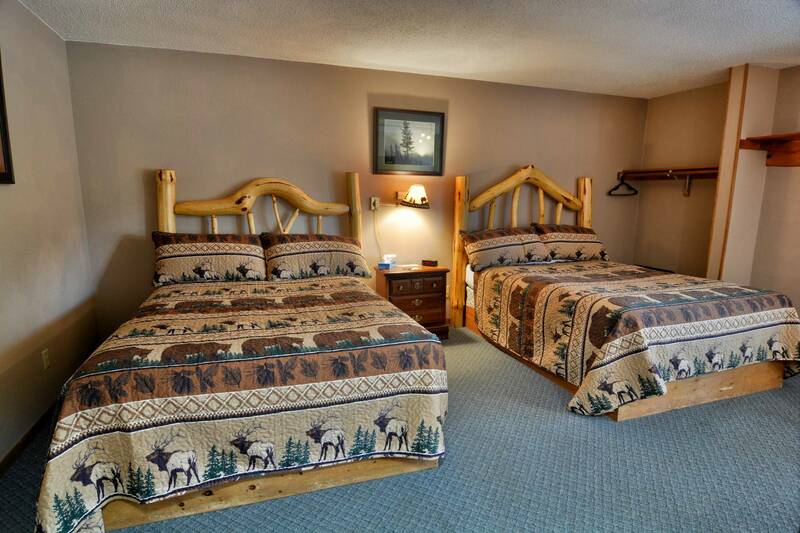 The motel in Clam Lake, Wisconsin makes a great place to stay when snowmobiling and ATVing Northwest Wisconsin trails! The Clam Lake Junction is located in the heart of the Chequamegon National Forest only 1 mile from the Day Lake National Forest Campground, the West Fork of the Chippewa River, Lake Namakagon, Lower Clam Lake & Upper Clam Lake. Be sure to make tracks to the Clam Lake Junction the next time you visit beautiful Clam Lake, Wisconsin! With clean, comfortable, affordable motel rooms just minutes from the water, trails, and other attractions, Clam Lake Junction is the PERFECT place to stay! Learn More! Watch this space for area news, and specials at Clam Lake Junction! Or stop in! 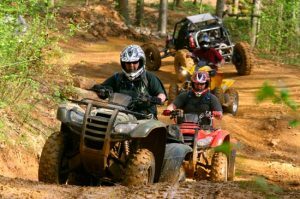 Located right on the snowmobile and ATV trails! © Copyright 2016 - All Rights Reserved | Web Design by CF Web Services, LLC.